Still no evidence of any substantial releases one would expect from collapsing seabed permafrost containment. For now it looks like the CH4 release from deep soil and seabed reservoirs will be slow. But at some stage there will be catastrophic degassing. Just like with land ice sheet retreat. Both Greenland and Antarctica will experience surges of ice loss associated with rapid sea level rise. Too bad some of this is not happening now. It would help wake up the BAU drones. The current slow transition is lulling the masses into a false sense of security. That’s an unpopular position I have to ascribe to. There is a lot of confusion amongst even our own posters here. Most folks want the economy to do well in the short term and support policies that sustain that while at the same time realizing in the long term the economy is killing the planet and this economic model must die. It seems harsh to wish the economy to die or for a auick SLR event. 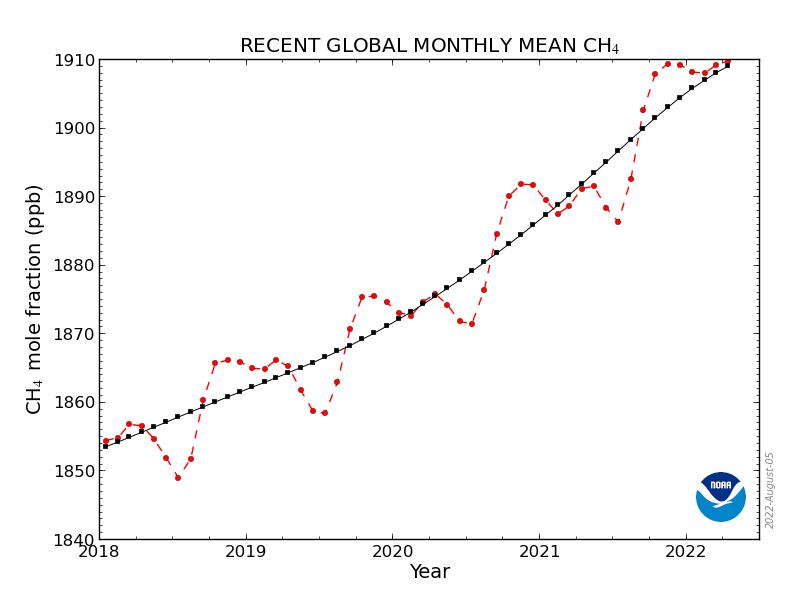 Methane has an atmospheric half life of seven years. The levels have mostly equilibrated, with methane being destroyed at the same rate at which methane is being released. How does rising faster indicate equilibrium?? NOAA's preliminary figures are for a rise of 10.99ppb in 2018, quite a jump from the 6.89ppb last year. Biggest jump since 2014. Will give the CO2e increase for the year quite a boost. Paul did a few video's on methane, from what I remember the gas is not a simple global mean issue that you can dismiss or focus on but a thing hard to measure as it goes up and up, breaks down and has lots of side effects. Like average temperature, it is the extremes that count. Like the Midwest flooding now. Looking for the video's, maybe better youtube search instead of website. Paul is a chess playing system analist, interested in abrupt CC since a decade or so, his opponent is CC and he is on the lookout for the next move, he looks at every possible angle, of what can happen and what can be done.